90 Day Money back Guarantee! 500w CEA Rated! Amp is perfect Thank you. Will comeback for more! Great product, delivery and great service. Thank you! Prompt shipping item as described. Happy Customer! Never recieved my item and seller had very bad communication. Disapointed.. This amp does function, But not really well. You can completely disregard all of the stated power claims, 2000w amp touted to produce 1000w RMS @ 1 Ohm in reality it can only provide about 500w @ 1 Ohm. I would definitely not buy again. Perfect for my application...always go by CEA wattage with Rockville. I already own a 5-channel RXH-F5 that puts out 500 CEA watts to a 2 ohm load on its 5th channel. I just wanted to add more subs to my setup. I bought an RXD-M1, ran a distribution block and more 4 gauge wire to power both amps, and used a 50 Hz test tone and a multimeter to match the output of the M1 to that of the 5th channel of the F5. Perfect result for my application. My subs have plenty of headroom and no distortion, my amps are not stressed at all, and I love the sound quality. Always go by the CEA rating on Rockville amps - they do CEA power all day, every day with no sweat. The M1 is no exception, 500 watts at a 1 ohm load without any problems. For my install, I really appreciated the M1's RCA outputs, made it easy to send the sub signal to the M1 and the 5th channel of the F5. If you are doing a modest SQ build, this is a great 500 watt amp. If you need more power, buy the bigger RXD-M4 or the RXD-M5; they only cost a little bit more but you need to upgrade your system's electrical system to compensate. 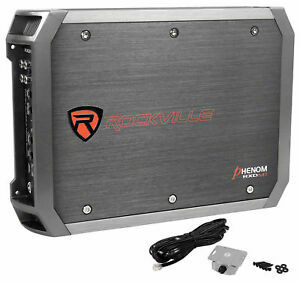 Rockville Phenom amps are a fantastic value, go by the CEA ratings and you can't go wrong. Good for a month and a half..